Many cities are fighting a losing battle against the ravages of nature, but is it possible to identify the world’s most vulnerable metropolis? Natural events are notoriously hard to predict – but the prospects for Malé do look particularly grim. 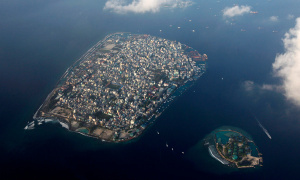 For even if its new sea wall continues to be effective, the islands around the Maldives capital are going to disappear before too long. And if they disappear, so does Malé’s raison d’etre. 1 Response to What is the world’s most vulnerable city? An interesting review of cities at risk. The capital of the Maldives is certainly a city living on the edge. I would have thought Cittagong and Mongla in Bangladesh would have been listed on equal footing. After that I think Miami and Miami Beach have to be facing life support. In the case of the latter two it isn’t just about rising sea levels. It’s also about seawater invading the aquifer from which Southern Florida draws its freshwater resources.